Brandon Jennings seemed to be in the cards for the Pistons for much longer than Joe Dumars let on. Despite publicly showing support for Brandon Knight, drafting KCP in the first round instead of Trey Burke indicated that there may be other plans in mind for the point guard position, which was in obvious need of an upgrade. With Jennings' contract situation reaching a head in Milwaukee, the door was open for Dumars to make a play, and he was able to do so deftly, sending only Knight and a few extraneous pieces in a sign-and-trade for the next three years of Jennings' career. Jennings is a high-volume scorer who, through four years in the league, has remained a remarkably consistent just-above-average point guard. He gets labeled as a teammate who is difficult to play with, but that's exaggerated. Players who take a lot of shots and aren't incredibly efficient often get this label, regardless of its basis in reality. The one thing that this doesn't address, which Jennings brought up in his introductory press conference, is the talent that flanked him in Milwaukee and what that did to his play style. In four years, the best teammates that Jennings had were Larry Sanders, Ersan Ilyasova, Andrew Bogut, and Monta Ellis, and not all on the same team. The talented point guard was lampooned with a team of humps and took it upon himself to be the guy. And why not when you can do stuff like this. Jennings will now be surrounded by as much frontcourt talent as any point guard in the league, and have Chauncey Billups and Mo Cheeks to mentor him. In addition, the above shot chart actually complements the Pistons' roster better than his shooting percentage might indicate. Jennings struggles at the basket but is able to light it up from the top of the key. With Monroe, Drummond, and Smith, Jennings' attempts at the basket should plummet, and those that still exist are likely candidates for Kobe Assists. Meanwhile, his ability to come off of high pick and rolls on the three point line and knock down threes will be crucial for the Pistons' offensive gameplan. Much of that is contingent, however, on Mo Cheeks being able to dissuade Jennings from holding onto the ball too long and tossing up contested jumpers late in the shot clock. Old habits are hard to break, and with the Pistons' expected spacing issues, Jennings may find himself with the ball and time ticking down on the shot clock. How he reacts in those situations could go a long way to determining the Pistons' season. 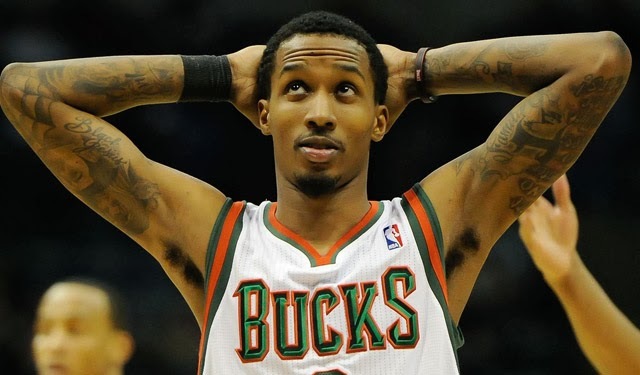 Jennings is the first in this series in which there is no question about his role this season. No one on the Pistons' roster will unseat him as the starting point guard. How that role develops this season will be something to watch, however. Does Jennings remain the slashing, inefficient point guard of his first four years or is he more judicious with his attack, learning to distribute to his big men and taking high-percentage threes off the pick-and-roll? I am confident that Billups, Cheeks, and a strong frontcourt will have a transformative effect on Jennings this season. He's too naturally gifted to wallow in mediocrity the way he has the last few campaigns, and his skillset should suit the starting rotation perfectly. Expect him to take less shots than in previous years but at a higher percentage, many of which come off of pick and rolls. His assist numbers should also spike as he learns to play alongside a cast of high-percentage big men. There may be an adjustment period early in the season, but Jennings should settle in nicely and be exactly the kind of point guard that a team starting Monroe, Drummond, and Smith needs.